OK I give up, what, where and why? I have found them on the fret but haven't a real clue which way round they go and at what position. I think I have found the lower front ones  and rear ones  on the plan drawing but at what height? The top leading ones  are so small - blink and you will miss them. 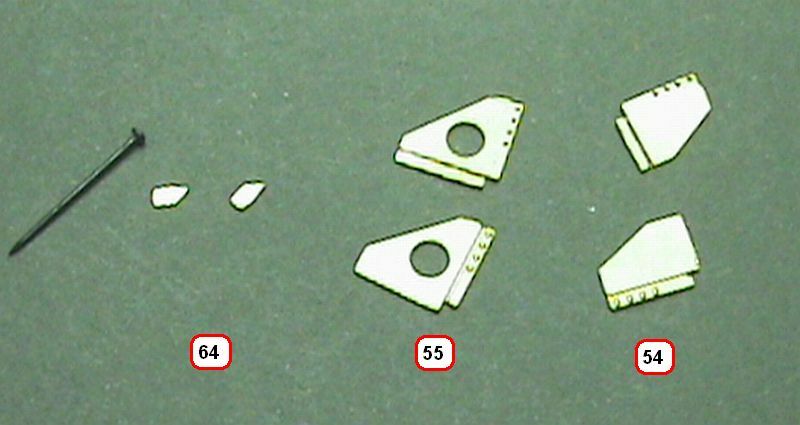 Anyway I did take the precaution of punching out the rivets on [54 & 55] before removing them from the fret. The instructions state "on this loco they are rather prominent, especially the leading ones which protrude through the steps". I cannot see how the small top ones can, yet still have a point of attachment. The lower ones will get in the way of the buffers and despite the hole will make attaching the body near impossible. Sure I know that the instructions say to add the buffers first but I do not like adding buffers and then clogging up the springs before painting. To add to this I have been unable to see any of these on the prototype photos and wonder if they will be visible on the completed model. The instructions also state "often these are ignored". Difficult aren't they, some of them are prominent on these locos and a lot of builders like to put them on. The difficulty with our models is that our buffers are not self contained but protrude through the buffer beams. Full size ones are just bolted on the outside and the gussets are usually in line with the centres to take buffing loads. I would suggest fitting them wherever they do not interfere with your buffers rather than worrying about exactly where they should be (or just leave them off). Thanks yet again Michael, that is at least a little clearer. I am using the Alan Gibson sprung buffers as per recommendation, though would have anyway. The gussets are going to be left off for now and will be reconsidered (along with a few other details) at the end of the build.